Level. The student's chair for multi-year learning. Level: The secret Learning eye-to-eye Increasingly, more schools are encouraging group learning sessions, combining students of various ages and academic years. Whilst this approach has obvious learning benefits, it's also a highly practical solution in many cases. To facilitate this ergonomically and pedagogically, students of various physical sizes must be able to sit comfortably at eye level - ideally at the same standard table height. The problem is, most classroom chairs vary greatly in size depending on the student age-range they're designed for â&#x20AC;&#x201C; not at all practical for group learning in this scenario! Our solution is the Level chair. With it's unique adjustable foot support, a single-height chair can accommodate a variety of student ageranges. Utilising an ingenious click-lock-release mechanism, students can easily move the foot support up or down to suit their own physical size. This allows them to sit at the same standard table height as older, or younger students alike â&#x20AC;&#x201C; whilst maintaining the correct knee-tofoot position. There are two basic sizes available - one suitable for elementary schools to match a table height of 71 cm, and one for secondary schools to match a table height of 76 cm. What makes the Level student's chair so unique is the adjustable foot support. This facility allows students from various age-ranges to sit on the same chair, whilst adjusting their foot-resting position to ergonomically suit their own individual height requirements. 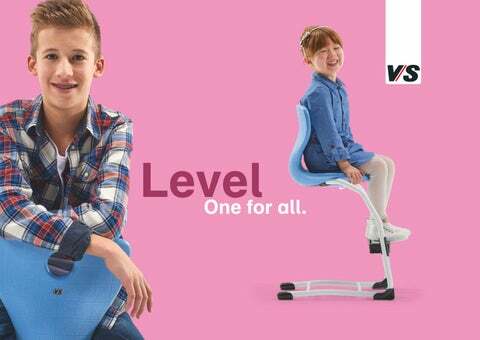 Multi-year learning made easy The Level chair can be adapted for use by students of different sizes thanks to its adjustable foot support. The click-lockrelease mechanism is easy to adjust and allows them to sit comfortably together at the same standard-height table as older, or younger students. The seat shell and tubular steel frame are available in various colour co-ordinations, lending a visual characteristic to any room, suited to your individual tastes. Completely stable Two welded cross-pieces between the steel skids stabilise the tubular steel frame, ensuring the foot support doesn't tilt or become jammed when adjusted. Also, because the foot support is securely anchored at all times, it cannot be removed and potentially lost or misplaced. Students can easily do it for themselves! The Level's foot support can be adjusted higher, or lower, depending on the student's individual height requirements. Thanks to the click-lockrelease mechanism we've developed, it can be easily moved and fixed firmly into position without the need for specific tools. It really is child's play! Level-LuPo Airy and comfortable The double-walled LuPo seat shell creates an air-cushioned effect, making sitting a particularly comfortable experience. The cantilevered frame also makes this chair exceptionally ergonomic. Level-VF Naturally comfortable As an alternative to the LuPo shell, we've also created a V-shaped seat shell made from beech plywood. This material brings a feeling of natural warmth to any room. The cantilevered frame provides the necessary flexibility to encourage natural body movement. Healthy, comfortable sitting We supply the Level with two seat shell variants. The Level-LuPo has a double-walled seat shell made from 100% recyclable polypropylene. The shell has a particularly ergonomic shape, designed to support the natural curvature of the spine when seated, or leaning back. The seat shell of the Level-VF is made of beach plywood. The seating surface is coated with non-slip paint, but still allows the visual and tactile qualities of the natural material to stand out. The Level-LuPo and Level-VF have identical frames: a cantilevered structure open at the back made from circular steel tube. This ensures dynamic, comfortable sitting and keeps the attention focused on sustaining concentration. Three materials are available for the glide elements below the Level's skids. Felt is suitable for hard floors such as parquet, tiles, stone or paving. Plastic is recommended for carpeted floors and smooth floors without linoleum. The FloorCare material developed by VS can glide almost anywhere silently, without causing damage. When students take the initiative and adjust the Level to the right height themselves, safety is the main priority. The new replaceable glide elements are recommended. It's then only necessary to replace the lining of the glide element rather than the entire unit. The operation takes just a few seconds, saving time and expense. Again, the Level sets high standards. The chair is extremely stable and isn't prone to tipping over. It remains rock-steady at all times - even if a student stands upright on the foot support itself! The foot support is extremely robust and is made from highly durable materials. It's quite simply designed to last and last! On-table storage and stacking The Level chair can be hooked over any table. To ensure it doesn't slip, or scratch the table top, the underside of the seating shell has an anti-slip strip (Level-LuPo) or area (Level-VF). When several stools are stacked on top of one another, the anti-slip strips - or area - also separates the individual seating surfaces. This prevents the formation of pressure points and protects the chairs from potential damage. Important: If the chairs are to be stacked, foot supports must be engaged in the top-most hole, referred to as the park position. A flexible learning environment designed for multiple age-ranges must satisfy each student's basic requirement to sit comfortably. The Level facilitates this easily and ingeniously. Learning effectively alongside one another, means students need to sit and work together in groups, at the same table height. To accommodate this, chairs have to be the same size, yet adaptable to suit the individual height of each student - hence our unique, adjustable footsupport. For teachers, there is also a Level version without foot support. Homework assistance The big help the small. That's no problem because everyone here can sit at the same table height, on the same-size chair, with their feet correctly supported. Younger and older students want to learn together at eye level â&#x20AC;&#x201C; and still be able to sit comfortably, with the correct ergonomic posture to suit their individual size. This shared working level is determined by the uniform height of the table and everyone feels at ease thanks to the height-adjustable footsupport. From vibrant to natural The polypropylene LuPo seat shell is available in eleven colours, while the beech plywood VF seat shell is available in ten different wood stains. VS's own kitchen garden produces fruit and vegetables for the company restaurant, based on organic principles. A sustainable approach – in harmony with nature Since 1898, VS has stood for sustainable production and quality, made in Germany. All production work is undertaken in Tauberbischofsheim, based in the German state of Baden-Württemberg over an area of 80,000 square metres. We are committed to protecting our environment, with every care taken to minimise any harmful impact on the global populous, wildlife and natural resources that could result from the manufacture, use, or disposal of our products. This is reflected in our products, recycling-oriented conception, environmentally responsible and resource-saving manufacture, through the highest-quality ergonomic design. Product responsibility For VS, responsibility starts with our conception of an idea for product development. This continues throughout the whole process chain from raw materials purchasing, production, adherence to quality and emissions standards, delivery, assembly and service right through to a return and recycling process for end-of-life furniture. 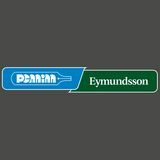 Environmental information We produce environmental information for all VS products, including specifications concerning the material and CO2 emissions. These are caused by the production process at VS, the transportation of parts from suppliers to us and of the product to the customer - as well as by the acquisition of the materials and their processing during production. Management systems. All VS's activities are underpinned by a certified quality, environment and energy management system. The targets in terms of quality, environmental protection and energy use are regularly checked and revised. UN Global Compact. VS is a voluntary member and therefore commits itself to playing an exemplary role in observing ethical, social and ecological standards in its business activities. PEFC certificate. For wood from sustainably stewarded forests and supervised sources; applies to all products with wood materials. GS "tested safety" label. Awarded by the TĂ&#x153;V inspection authority on the basis of the German legislation on product safety. LGA "pollutanttested" certificate. Guarantees that the pollutant limit values correspond to or are well within the legal requirements. Platinum levelTM. The highest level of the sustainability certificate issued by the Business Institutional Furniture Manufacturers Association; applies to all VS products manufactured at the Tauberbischofsheim site. Label issued by the Healthy Backs Campaign (Aktion Gesunder RĂźcken e.V). For products that are very highly recommended due to their ergonomic design. We manufacture long-life products and always consider environmental aspects when choosing our materials. We consider all the employed materials from a uniform, all-embracing product lifecycle perspective - ensuring products can be reintegrated in the material cycle. When using our raw materials, we reduce offcuts and waste to a minimum. Any offcuts are re-used. For us, sustainable business activity means always acting responsibly toward people, the environment and society. Our core objective is to market outstanding products under economically sensible conditions. We manufacture all our furniture in Germany in an environmentally responsible and equitable way. As a voluntary member of the UN Global Compact, we are actively committed to enhancing sustainability and fighting corruption. Our products are regularly inspected by well-known, independent institutes for quality, safety and environmental responsibility. All products containing wood-based materials manufactured at the Tauberbischofsheim site comply with the PEFC standard and all the products manufactured here have been awarded the BIFMA Platinum level. Series products meet the requirements of the GS (tested safety) label. Most of them also have the LGA "pollutant-tested" label and/or the Greenguard certificate. We design our tables and chairs to fulfil ergonomic criteria. The AGR certificate testifies to their outstanding ergonomic characteristics. You can find the various certificates for the individual models and model variants at www.vs.de/kataloge/zertifikate/.